In 2011, Nancy Shaffer's life suddenly changed when she was diagnosed with what would be a fatal brain tumor. In 2011, Nancy Shaffer's life suddenly changed when she was diagnosed with what would be a fatal brain tumor. Here is her heartrending and heartwarming account of her final year as she came to terms with impending death. 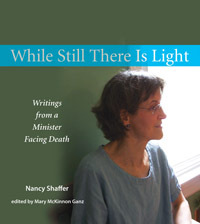 Part journal, part meditative reflection, and fully honest, Shaffer's account of her journey through denial to peaceful acceptance will lend inspiration and courage to those in need, and insight to those who give pastoral care. but who may need to lead my memorial service." "How a person lives says a lot about how a person dies. Nancy Shaffer's poignant book is full of life and vibrancy in the face of terminal cancer. Her writings do not shy away from the difficult subjects of end of life, including broken relationships, anger, and disappointment. As a hospice chaplain, I would recommend this book to those entering end of life, and those who have a loved one at end of life." —Andrew Tripp, chaplain with Dr. Matthew Shwartz Hospice in Chelsea, MA.